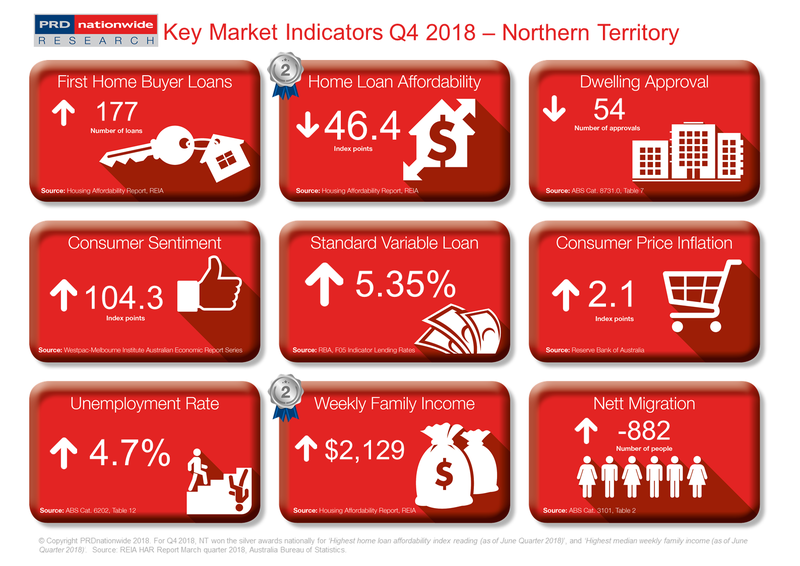 The Northern Territory (NT) continued its streak as one of Australia’s most affordable markets, taking out the silver award nationally for the highest home loan affordability index reading (as of June quarter 2018) at 46.4 points. This positions the NT as a leader in the market for first home buyers, which was reflected in the 1.1% growth in the number of first home buyer loans over the 12 months prior to June quarter 2018. A slight decrease in the affordability index reading can be viewed positively for property owners however, as it may point to a return in positive median price growth. The NT has also taken out the silver award again nationally for the highest median weekly family income (as of June quarter 2018). At $2,129 per week, income growth was recorded at 1.7% in the 12 months prior to this period. Although this is below the Australian average of 2.4%, in real dollar terms this presents less of a concern due to the already higher median income enjoyed by those living in the NT. Despite increasing in the past 12 months, the NT has a low unemployment rate of just 4.7% as of June quarter 2018. This remains below the national average of 5.0%, suggesting that there are more people employed in the NT. Combined with a high home loan affordability index reading, this suggests a greater chance for first home buyers to enter the property market in the near future.